Three scientists at the Marshall Space Flight Center, complete a training session in the MSFC’s Neutral Buoyancy Simulator. 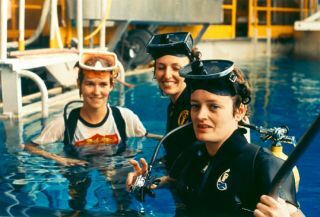 In this historical photo from the U.S. space agency, Dr. Mary Johnston, Carolyn Griner and Dr. Ann Whitaker (left to right), scientists at the Marshall Space Flight Center in 1974, complete a training session in the MSFC’s Neutral Buoyancy Simulator, a facility used to simulate weightlessness. The scuba diving is part of special training the three took to better qualify them for their duties of designing experiments on materials processing in space. The training increased their understanding of the problems associated with doing experiments in space, such as aboard Spacelab. Dr. Johnston specializes in metallurgical engineering, Carolyn Griner in materials sciences, and Ann Whitaker in lubrication and surface physics. Carolyn Griner continued her career at MSFC, serving as the director of the Mission Operations Laboratory. In 1994 she was appointed as Deputy Director of MSFC, and for 9 months in 1998 served as acting Director. She retired from NASA in December 2000. Over a 16-year period Dr. Ann Whitaker served at NASA as chief of the Physical Sciences Branch, the Engineering Physics Division, and the Project and Environmental Engineering Division. In 1995 she served in several leadership positions in Marshall’s Science and Engineering Directorate. In September 2001, Dr. Whitaker was named director of the Science Directorate at MSFC.